At my last job, we used to talk about how the only way to avoid disappointment was by setting clear expectations. In the case of the “Super Blue Blood Moon,” the rest of the internet has set the expectations: that you’ll see it. But for many, that’s not the reality. I know that everyone is excited about this new lunar eclipse because it has some crazy long name: “Super Blue Blood Moon.” The “blue” part is meaningless, astronomically—it just refers to the fact that this is the second full moon of the month. The “super” part means the full moon occurs when the moon is closest to the Earth in its orbit, and is not a scientific term. The “blood” means it’s during the lunar eclipse. The moon will look a little bigger than usual and somewhat dark red to folks in most of Asia, the Pacific, and Australia. But the full eclipse won’t be visible to the East Coast of the U.S., Europe, Africa, and South America. Who cares about those regions? Realistically, I do—it’s very roughly half of Gizmodo’s readership, likely more. If you’re in the half that’s going to see some of the total eclipse, great! It will be very exciting, and you can stop reading this and go look up what time you’ll have to stay up until (or what time you’ll have to wake up). But if you’re part of Gizmodo’s readership that won’t be able to see the most spectacular part of the eclipse, when it passes into the Earth’s umbra and turns a deep, red hue—I’m with you. On the East Coast, we will only see a chunk removed from the moon just before it sets in the morning, as shown above. Many others, like those in Europe, will merely see a regular (perhaps larger than usual) full moon. I’m just trying to set expectations here, because despite the incredible amount of hype, eclipses are never worldwide events. 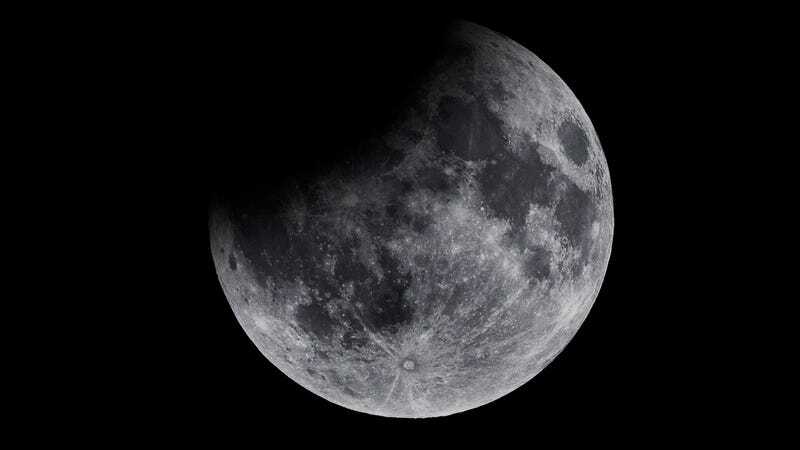 The moon will pass behind the Earth occasionally, regardless of where the humans are located. We live on a ball, so if you’re on the wrong spot, you might miss most or all of the event. So enjoy your super-blood-blue-red-big-bad-whatever moon, if you’ve got it—it will look pretty cool. If you’re not able to see it, I’m sorry everyone else is making you feel left out. But don’t worry. There’s going to be a lunar eclipse next January that will also occur during a supermoon, reports The Verge, meaning it will be exactly the same as this moon, because “blue moons” are of complete and utter unimportance. And in America, we’ll have a much better vantage point, at least. In the mean time, keep looking at the moon, tomorrow night and every night you get a chance to see it. It’s a beautiful thing.